Various blogs have already covered this story since it hit the web yesterday, April 4, 2015. A related entry posted on Facebook by Definitely Filipino has gotten 6,987 likes and 1,280 shares as of 4:05 PM, April 5, 2015. 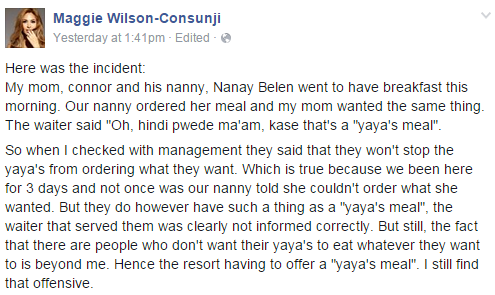 Gist: Model/Beauty Queen/Lifestyle Blogger Maggie Wilson-Consunji and family went to 'Balesin Island Club' in Polilio, Quezon to cap off the Holy Week only to learn that the exclusive resort serves separate meals for yayas aka 'Yaya Meal' and has a 'No Credit Card, No Food' policy. Bothered by an incident where the waiter specifically pointed out the existence of such meal in front of her mother, son, and nanny, Maggie took to Facebook and shared bits of the experience. 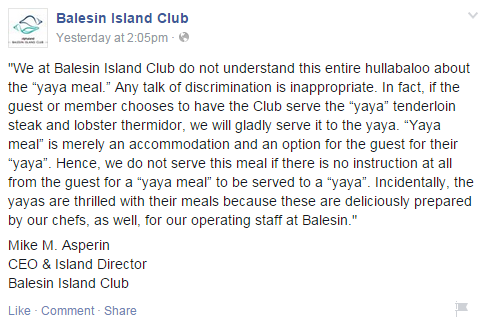 TechPinas is open to publishing the official statement of Balesin Island Club if and when its management decides to release one as a way to let Pinoys in social media learn their side of the story.